Most popular: Very easy to use, offers a solid power and good versatility thanks to the five different spray nozzles. You can use practically any power sprayer to wash your car, truck or another vehicle because only a little pressure is required for this task – you should be rather careful not to damage the paint so using a wider spray setting is recommended. Also think about if you’re going to use the tool for another cleaning jobs that require more power – or if a cheaper light-duty unit is all you need. Removing tough dirt, mud and grime from concrete requires a lot more power that washing a car for example. For smaller areas electric units are pretty adequate (and with some effort even for medium-sized) – but if you need to clean a larger spot or even an entire driveway, getting a powerful gas machine would be a much better option – you probably don’t want to spend an entire day on one cleaning job. Quality gas powered pressure washer for a consumer use – starts easily, offers plenty of power and its construction is solid and durable. How to buy the right pressure washer? Light-duty electric – they are cheaper, compact and easy to carry around. Perfect if you need to do only light cleaning jobs – but lack power for tough grime, also washing a larger area takes ages with them. Medium-duty electric – the most popular ones – they are not overly expensive but offer enough power for most cleaning jobs around your house and garden. Gas powered – if you need to use the washer frequently or clean larger areas, these would be your best bet. They are quite expensive but also offer the most power. What is a pressure washer and do I actually need one? A power sprayer is a tool used for removing all kinds of dirt, grime, mold or grease from cars, buildings or wooden, concrete and other surfaces. It takes water from a garden hose and engages the pump to push it out of the wand with a lot more pressure – also, several different nozzle types are used to shape the water fan and adjust the power of the stream. To rate different models two variables are used – PSI (pressure per square inch) and GPM (gallons per minute) – and while the small electric units have about 1500 PSI, gas powered machines can offer even 3200. 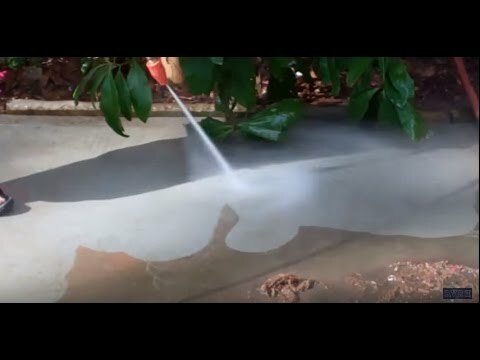 The difference in power is just huge – a garden with 40-70 PSI is simply not able to remove that kind of dirt that a 1400-3200 PSI washer eliminates without any problems. Disclaimer: HiveFly.com is a participant in the Amazon Services LLC Associates Program, an affiliate advertising program designed to provide a means for sites to earn advertising fees by advertising and linking to Amazon.com.